Toast to a happy future with our personalized champagne wedding favors. Elegant, unique favors, these clear glass champagne flutes have an intricately designed stem and measure 8.5" tall by 2.125" in diameter. 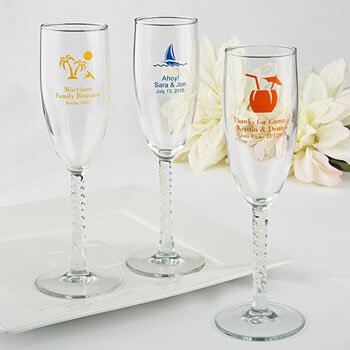 Customize these glasses with your choice of design, color and message. A wonderful gift your guests will surely treasure, the personalized champagne wedding favors make a dramatic and beautiful addition to your d�cor. The glasses came out exactly as expected, actually even better. very proud to give them out at my parent's 50th anniversary party. I ordered the boxes for them also just to add a classy touch. Absolutely perfect party favor! I highly recommend it! Wow!!!! Absolutely lovely!!! THE perfect 5 year anniversary favor. Awesome, kind customer service, and great quality!!! May God bless you and thank you for making our favors so pretty and special!!! I was really blown away when we received our champagne flutes. They were such a wonderful quality. Strong thick glass with a beautiful spiral stem. The engraving was clear and the white boxes made all the difference for presentation. I will shop here again!! Very nice Champagne flutes. Received on time ... Topped off our dinner party and made it elegant.